Berkeley Independent Study is a program of Berkeley High School, and offers an academically rigorous alternative to the typical classroom environment. Students must be self-motivated and organized to succeed at BIS. In the K-8 program, parents/guardians accompany students to weekly 90-minute meetings with teachers. Assignments adhere to state curriculum standards while accommodating students’ interests and abilities. BIS provides instructional materials, and tutoring is available. Parents/guardians act as home teachers for all of the K-8 lessons. They need to be available to educate and supervise their children’s studies at home for 20-25 hours of coursework per week. Students fulfill the same course requirements as at Berkeley High School and earn the same high school diploma by meeting individually or in small groups with their instructors weekly. Students at BIS complete ten hours of homework per course every week. They earn five semester credits for each quarter course they complete (typically 3 courses each quarter). 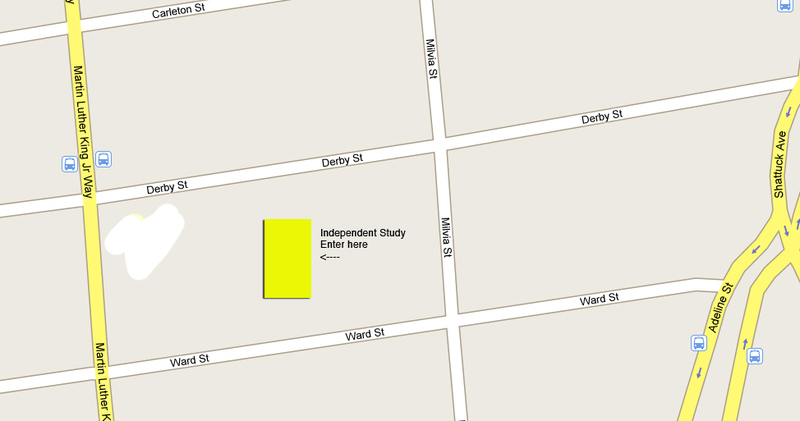 Courses not offered on the Berkeley Independent Study campus may be taken concurrently at the high school. Most Berkeley High School courses are offered at BIS. Many different kinds of students attend BIS: those who excel academically, or are taking college courses, students who have jobs, students with children, students with major athletic or artistic pursuits, students with emotional or health-related issues who need mentoring, or students who for some other reason are seeking an alternative educational environment. Many have found that BIS has been fine preparation for college and life. To view website, click here.